Francis Cox was born about 1780 in Virginia, the youngest child of James and Elizabeth Cox. He would marry Peninah Walden, born about 1790, daughter of William Walden and Catherine Foley, neighbors along the Smith River in northern Patrick County, Virginia. Following, in chronological order, are some of the facts known about their lives and family in Virginia. MARRIAGE: A marriage bond was recorded at the Patrick County Courthouse on 7 February 1809 with Abel Pedigo as the security and witness. The marriage occurred on 8 February 1809, a Wednesday, with Lewis Foster as the minister. The marriage likely took place at Foster’s meeting house near Dobson, just south of Smith River. TAX LIST: Francis Cox appears on the 1810 Tax List of Virginia in Patrick County, as does his brother (Randolph) and his father (James). Francis is listed with one tithable (white males over 16 years old), no slaves, and two horses. Lists of tithables do not enumerate anyone under the age of sixteen or any adult white woman unless she is the head of a household. 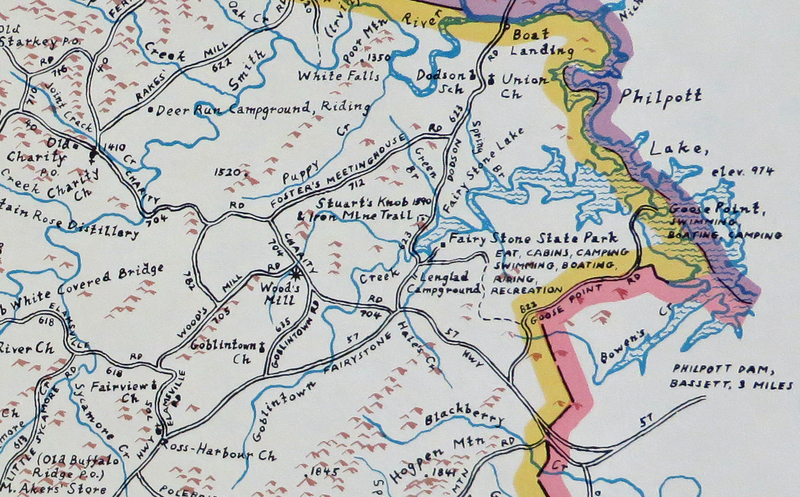 There are no 1810 U.S. Federal Census records for Patrick County. The Tax List serves as a substitute. LAND: In the Patrick County Courthouse are recorded three deeds on April 1st, 1812, transferring 50 acres each from James Cox to three of his children – Francis Cox, Randolph Cox, and Elizabeth (in the name of her husband, Jeremiah Burnett). The sales price of each transaction – $1. It appears that James Cox was gifting 50 acres on the north side of the Smith River to each of the three children. CENSUS: The 1820 U.S. Federal Census suggests that James Cox and his children continued to live near one another in this area as they are listed sequentially on the census page (Francis Cox, James Cox, Jeremiah Burnett Jr, Randolph Cox). The other entries on this page are not in alphabetical order, making it likely that the enumerator listed each family in the order he visited their homes. Francis and Peninah are enumerated on this census with four children, likely including Daniel R. Cox (born about 1811), Moses Cox (born about 1816), another unknown male child under the age of 10 years, and one female child under 10 years (likely either Sarah or Elizabeth). Francis is listed in the ’26 thru 44′ column, making his year of birth between 1776 and 1794 (consistent with the estimated year of birth of 1780). Peninah is listed in the ’16 thru 25′ column, making her year of birth between 1795 and 1804. This is incorrect as later documentation shows she must have been born prior to 1792 (see below). 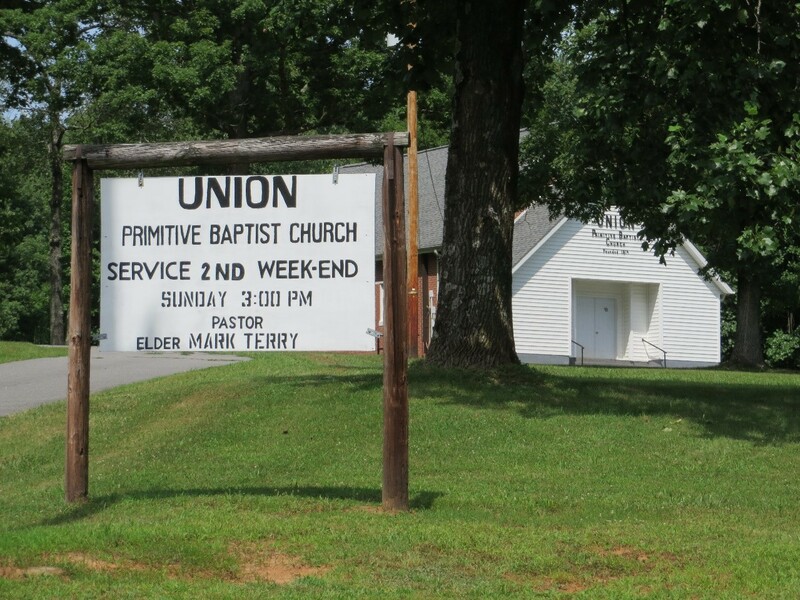 CHURCH: In The History of Patrick County, Francis Cox is listed as one of the 19 original members of Union Primitive Baptist Church in 1821. The other members were John Washburn, John Foster, Richard Massey, William Walden, Jeremiah Burnett, Randolph Cox, Nicholas Grimmett, James Ingram, William Turner, Alexander Ingram, Jane Turner, Selah Handy, Martha Ingram, Elizabeth Ingram, Jane Cox, Elizabeth Burnett, Margaret Walden, and Susannah Foster. From this list, William Walden is the father-in-law of Francis Cox, Jeremiah Burnett his brother-in-law, Randolph Cox his brother, Nicholas Grimmett his brother-in-law, Jane Cox his sister-in-law, Elizabeth Burnett his sister, and Margaret Walden his step mother-in-law. One notable name missing from the list is that of his wife, Peninah, given that her husband and her father are founding members. The church has had three locations during its history, all in the vicinity of Union Bridge, south of Smith River and north of Goblintown Creek. 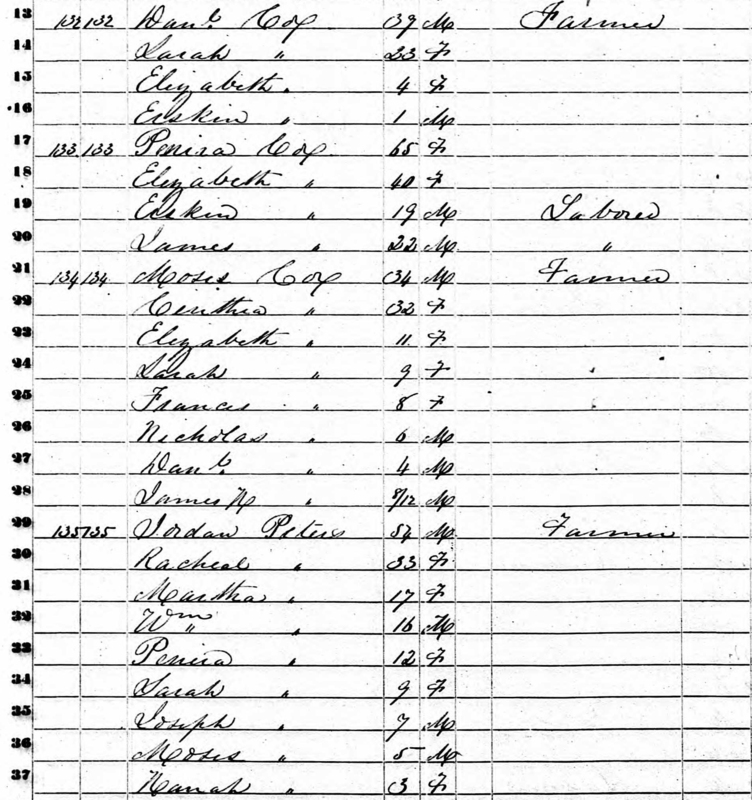 CENSUS: In the 1830 U.S. Federal Census, Francis and Peninah are enumerated with eight children in the household in Patrick County. The census page appears to be sorted by first letter of last name, and no other Cox families appear on the page with Francis, likely signifying a move away from his brother and father. Francis is listed as age ’40 thru 49′, making his year of birth between 1780 and 1790. Peninah is listed as age ’30 thru 39′, making her year of birth between 1790 and 1800. WILL: The last will and testament of Francis Cox was written on 9 December 1835 and admitted for probate on 2 August 1836 in Franklin County, Virginia. Therefore his death likely occurred in late July of 1836, and not in 1835 as is frequently recorded. In his will, Francis Cox names seven of his children as well as his wife as heirs. There is no mention of a child named “James”, making it possible that this child died prior to 1835, or that only seven children were born to this couple. Moses Cox and Peninah are named as the executors. 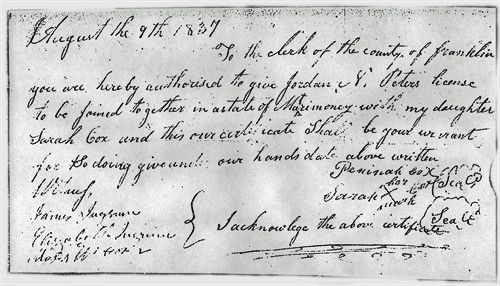 Both Sarah and Elizabeth are named with the surname “Cox”, making it unlikely that either has yet been married. One unusual finding is that Daniel R. Cox is listed as an heir in the actual will document, but is left out of the recorded document in Will Book 4. This was probably due to a transcription error by the clerk. Apparently Francis and Peninah relocated across the county line north and east of Smith River between the census in 1830, and the writing of his will in December of 1835. MARRIAGE OF CHILD: A little over a year following her father’s death, Sarah Cox would marry Jordan N. Peters, becoming his second wife. Perhaps because of the distance to the courthouse in Rocky Mount, or perhaps due to poor health, Peninah Cox pens an “authorization” for her daughter Sarah to marry Jordan Peters and sends it to the Franklin County clerk. It is witnessed by her neighbors, James and Elizabeth Ingram, and by her son, Moses Cox. The marriage would take place on 24 August 1837 in Franklin County, Virginia. This was the second marriage for Jordan Peters. Sarah and Jordan would have one surviving child, a girl named Peninah. Sarah would die in 1841 following the birth of their second child, which did not survive. Of note, Jordan Peters eldest daughter by his first marriage, Cyntha, married Moses Cox, the second son of Francis and Peninah Cox. Thus from 1837 until 1841, Jordan Peters was both father-in-law and brother-in-law to Moses Cox. CENSUS: The 1840 U.S. Federal Census records Peninah Cox still in Franklin County, most likely living adjacent to her two eldest sons, Daniel and Moses, who are enumerated as heads of households on the same census page as their mother. There is one other female in her household, age ’20 thru 29′, likely her daughter Elizabeth; there are three males in the household less than 20 years old, likely Jeremiah, Joseph, and Erskine, her youngest sons. Daniel Cox has two boys and six girls listed in his household, as well as his wife. 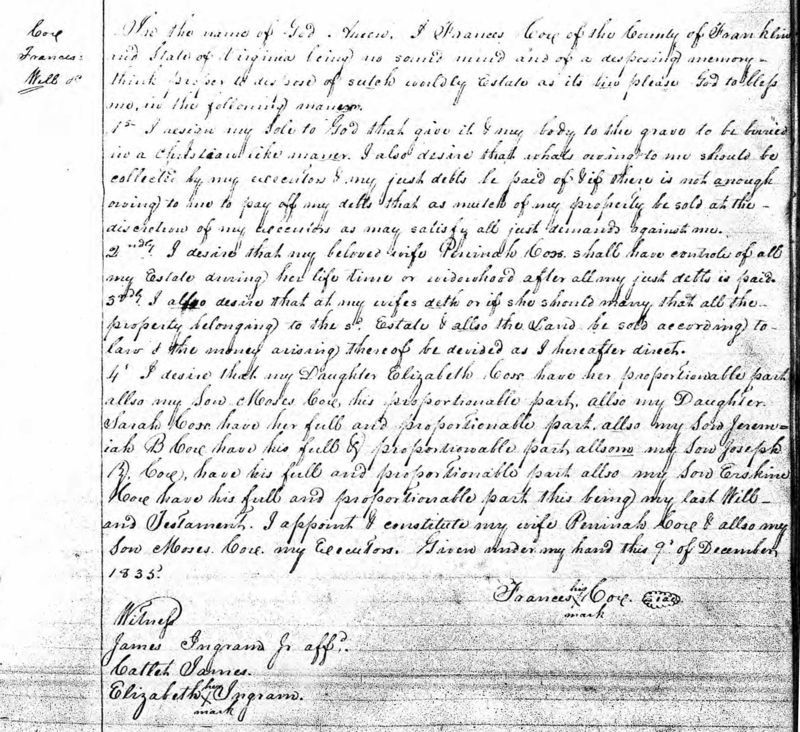 Moses and Cyntha Cox are enumerated with one female child under age 5 years. LAND: In February of 1848, Peninah Cox recorded a transaction in Patrick County selling her half interest in the one hundred acre farm of her father, William Walden, deceased, on the north side of the Smith River. The precipitating event is the death of her step-mother, Margaret. William Walden had first married Catherine Foley in August of 1782 – it is assumed that Catherine died prior to his remarriage in August of 1792 to Margaret King. Hence, Peninah was born before 1792. The other half interest was sold to the buyer, George W. Martin, by Peninah’s sister, Sarah, as they were the only two heirs of William Walden. 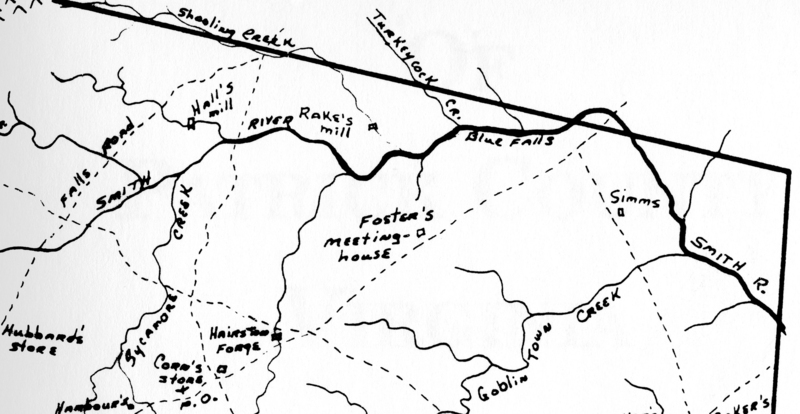 CENSUS: By the enumeration of the next U.S. Federal Census in September of 1850, the Cox families had migrated from Franklin County northwards into what would soon become the state of West Virginia. In four separate but presumably adjacent households in the newly formed Raleigh County are listed Peninah Cox, living between her two sons, Daniel and Moses, and her former son-in-law, Jordan Peters. The reason for the families’ relocation from Franklin County to Raleigh County is not known. Under occupations, the three male heads of households are listed as “farmer”, so it is unlikely that they moved for jobs in the developing coal industry. In the entry for the Peninah Cox household, her age is recorded as 65 years old, making her year of birth 1785, differing from previous estimates. Elizabeth is listed next in the household at age 40 years, most likely the still unmarried daughter. Erskin is enumerated next, age 19 years, and a laborer. The final household member is James, age 22 years, and also a laborer. Given that he is out of age order, and that there is no mention of a “James” as a child previously, it is difficult to know for sure if this is a child of Peninah’s, a relative, or someone unrelated staying with the household at the time of census. The 1850 census is the last extant record of Peninah Cox known at this time. No record of her death or burial has yet been discovered. Further research into this family is ongoing, and any contributions or corrections from fellow family history researchers would be greatly appreciated. Additions and revisions will be incorporated into this web page, and the date of revision noted below.